Not the wine, the Eutypa version! What causes it, and how best to deal with it? I could of course look it up but who needs to be resourceful when you have the DJ's?! Eutypa is present in many vineyards- of all ages. All wine grape varieties are susceptible to Eutypa Dieback along with many other plants including Almonds, pome fruit trees and willows. All can be a source of disease. Eutypa is caused by the fungus Eutypa lata. The fungus produces ascospores on old infected wood and is spread by rain splash traveling on the wind. The spores are able to travel large distances and can infect fresh, unprotected wounds, such as those left by pruning cuts. Spores are produced all year but can only infect fresh cuts during wet weather. Once a vine is infected with Eutypa the only method currently available to growers to eradicate the fungus, is to remove infected tissue using remedial surgery. There are two main approaches to remedial surgery. i) Cutting off the trunk at least 10 cm below any signs of obvious infection and training up a watershoot or grafting. ii) Training a healthy shoot from the base of the trunk and removing the infected trunk once the new shoot begins cropping. Click here for more tips on remedial surgery. Once inside the vine the fungus slowly grows spreading over a period of years along cordons and down to the trunk. Eutypa moves along the vines water-plumbing (the xylem). Eutypa dieback causes characteristic stunted shoots, most obvious in spring, small bunches and in cross-section, a wedge of discoloured dead wood. It contributes to the decline of vineyards by reducing growth and yield. Bunches are smaller from a Eutypa infected vine, compared to healthy vines. Eventually Eutypa will kill vines. 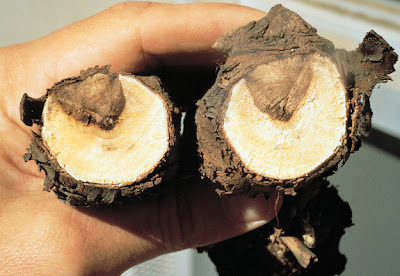 Eutypa infection can be prevented by avoiding pruning cuts during wet weather. Pruning cuts made in early winter remain susceptible to the disease for some weeks, while those made in early spring heal much quicker. I would like to ask a similar question with a slight modification. I read a lot about rejuvenating an old vineyard and some authors recommend to cut the trunk almost to the ground so the root system will send some new shoots close to the cut. Is this really possible, would the vines produce new growth from the old trunk? Vinifera is basically a weed its harder to kill than you think. Having said that it would be risky to cut at ground level. If they are 80 years old the root system will be massive which will help. Before you get the chainsaw out get someone in the know to assess the yard and get a plan together. Most old vineyards like yours just aren't viable. But if your thing is making Old Vine Grenache then it might be doable. Personally rather than risk a failure with the few remaining vines I'd start by training a water shoot up (maybe 2)from near ground level, you might have to do a hard prune of the head to encourage this. When you've got some viable shoots then cut the head off the next year. The following year (year 3) the stump will go nuts with new shoots with any luck. Of course I'm assuming the Eutypa is removed if you do get to the cutting stage. Following that I already organised for two experienced people to come and have a look at the vines.